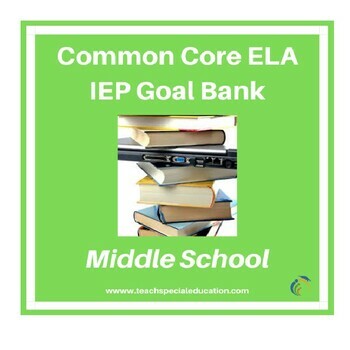 This IEP goal bank was created to assist special education teachers with the task of writing standards-based IEP goals in English Language Arts. Speech-Language Pathologists should also find this resource to be useful when creating IEP goals and collaborating with teachers. After spending countless hours developing IEP goals myself and really having to think through how to best individualize goals and objectives for my own students, I wanted to share this resource to help other special education teachers gain back some of their precious time. An introduction and guide that explains how to use the document. 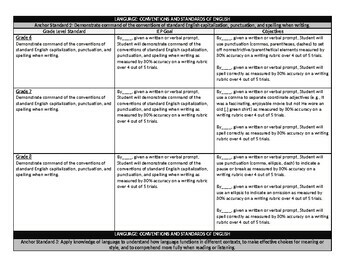 A step-by-step process for writing standards-based IEP Goals. Each grade level ELA standard for Grades 6-8. Standards for Foundational Skills, Language, Speak and Listening, Reading Informational, Reading Literature, and Writing. 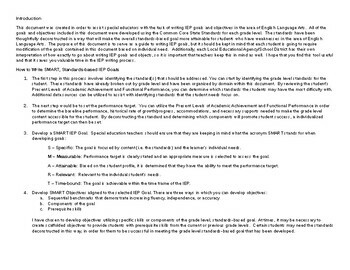 Grade level standards-based IEP Goal(s). Scaffolded objectives that are based on the deconstructed standard. 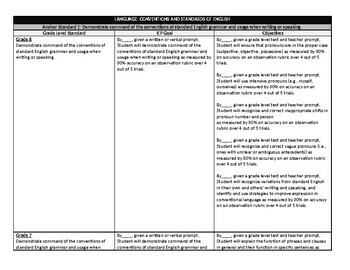 This document is formatted in Word so that you can easily modify the goals to meet the individual needs of your students. Purchase of this product allows for one license for one individual only. Sharing of this document is not permitted and if there is a need to multiple users, please plan for the purchase of multiple licenses.